Heartburn is a common digestion problem that causes burning sensation in the chest region. 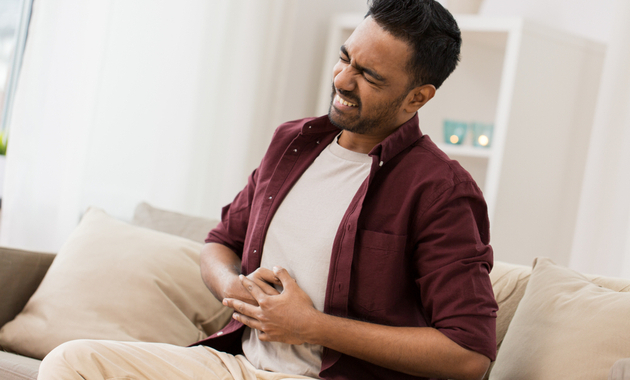 It is also known as acid reflux and it occurs when the stomach acid gets pushed into the oesophagus, a pipe which connects the mouth to the stomach. It is a common symptom of gastroesophageal reflux disease (GERD), which has a prevalence rate of 7.6–18.7% in India. There are many factors that can cause heartburn such as lack of sleep, improper diet, smoking or infections. However, there are few simple tips that can help you relieve heartburn and prevent other digestive complications. So before you plan to consult a doctor, try these tips to get rid of heartburn. 1. Eat small, frequent meals. One of the simple tips to lower your risk of acid reflux is to eat small yet frequent meals. This is because, when you overeat, it puts extra pressure on the lower oesophagal sphincter (LES), which is a valve-like muscle. This muscle prevents the acid content in the stomach from entering the oesophagus. 2. Eat a low-carb diet. Numerous studies have reported that a low-carb diet can improve symptoms of heartburn in obese individuals. It may be because excess carbohydrates can make you gassy and bloated, which in turn can lead to heartburn. Hence, opt for low-carb meals to prevent and treat GERD. When you eat slowly and chew your food properly, it provides sufficient time for the digestive juices to break down the food and digest it. But, if you eat your food too fast than it is not digested properly. This, in turn, can lead to indigestion, acidity, and heartburn. 4. Avoid eating late at night. Unhealthy eating habits are one of the leading causes of digestion-related problems. And eating late at night because of work pressure or snacking heavily in the evening can, in turn, make you more prone to heartburn. So avoid this habit of late night snacking or eating close to bedtime. 5. Say no to raw onions. Most people tend to eat raw onions along with meals or add it in salads. But if you are prone to acid reflux avoid this as it can increase the frequency of heartburn and belching. Raw onions contain a high amount of fermentable fibers which produce more gas during digestion. Also, compounds in raw onions irritate the oesophagal lining further worsening the condition. Carbonated drinks temporarily weaken the LES and increase the frequency of belching due to acid reflux. The presence of carbon dioxide in these drinks increase the amount of acid that enters the oesophagus. 7. Chew gum to improve digestion. Several studies have shown that chewing sugarless gum can help deal with acidity. When you chew a gum it causes an increased production of saliva, which helps in clearing out excess acid from the oesophagus. 1mg Exclusively Brings Best Selling Products For Bad Stomach. Grab It Now..!! 8. Limit intake of coffee. One of the key ways to prevent heartburn is to avoid foods that trigger acid reflux. Coffee is one of these foods. It is reported that coffee temporarily weakens the LES, which puts you at risk of acid reflux. But there is no clear reference on what makes coffee a bad food for people with heartburn and acidity. 9. Do not drink alcohol. It goes without saying that drinking alcohol is bad for the health, more so if you suffer from heartburn. Alcohol not only increases your risk of acid reflux but also worsens the condition. It promotes the production of stomach acids and impairs the ability of the LES to clear up acid. So avoiding alcohol can help to ease the symptoms of heartburn. 10. Avoid exercising right after eating. Exercising can aid in digestion but not when done right after meals. If you exercise right after meals it can hinder with the process of digestion and can lead to a build-up of acid in the oesophagus. This can lead to heartburn and worsen the condition if you already suffer from heartburn. So give your stomach some time to empty its contents before you start exercising. 11. Do not sleep immediately after meals. It is important to maintain a gap of at least three hours between eating meals and hitting the sack. Lying down immediately after eating can increase the pressure on the LES which can make you vulnerable to acid reflux. Maintaining a gap can help the stomach to digest the food and prevent heartburn. 12. Raise the head of your bed. If you experience heartburn especially during the night, then the position of your bed could be blamed. A 2006 study in the journal Archives of Internal Medicine revealed that adopting the bed-up position can improve the clearing of stomach acid and also reduce the frequency of acid reflux. Ensure the head of your bed is elevated to prevent heartburn and have a good night sleep. 13. Avoid sleeping on your right side. Have you ever thought that the way you sleep can also lead to digestive disorders? Sleeping on the left side can not only help you sleep better but also prevent heartburn. According to a study published in the American Journal of Gastroenterology, sleeping on the right side can worsen the symptoms of acid reflux. This is because when you lay on the right side, the chances of acid leaking through the LES is high, increasing the risk of heartburn. 14. Try to lose weight. If you are overweight and suffer from acid reflux, then losing weight should be a priority. This is because, excess fat, especially in the abdominal region, puts pressure on the stomach and the LES. This pushes the stomach acid upwards, which leads to acid reflux. Certain medicines can cause acid buildup or inflame the oesophagus, which can lead to heartburn or worsen the condition. Hence, talk to your doctor about the medicines you are recommended to be doubly sure of its side-effects such as heartburn. If your symptoms still persist, it is wise to consult your doctor to get rid of heartburn. Stomach Ache: When To See A Doctor? 1. Arivan R, Deepanjali S. Prevalence and risk factors of gastro-oesophagal reflux disease among undergraduate medical students from a southern Indian medical school: a cross-sectional study. BMC Res Notes. 2018 Jul 9;11(1):448. 2. Austin GL, Thiny MT, Westman EC, Yancy WS Jr, Shaheen NJ. A very low-carbohydrate diet improves gastroesophageal reflux and its symptoms. Dig Dis Sci. 2006 Aug;51(8):1307-12. 3. Allen ML, Mellow MH, Robinson MG, Orr WC. The effect of raw onions on acid reflux and reflux symptoms. Am J Gastroenterol. 1990 Apr;85(4):377-80. 4. Kaltenbach T, Crockett S, Gerson LB. Are lifestyle measures effective in patients with gastroesophageal reflux disease? An evidence-based approach. Arch Intern Med. 2006 May 8;166(9):965-71. 5. Van Herwaarden MA, Katzka DA, Smout AJ, Samsom M, Gideon M, Castell DO. Effect of different recumbent positions on postprandial gastroesophageal reflux in normal subjects. Am J Gastroenterol. 2000 Oct;95(10):2731-6.